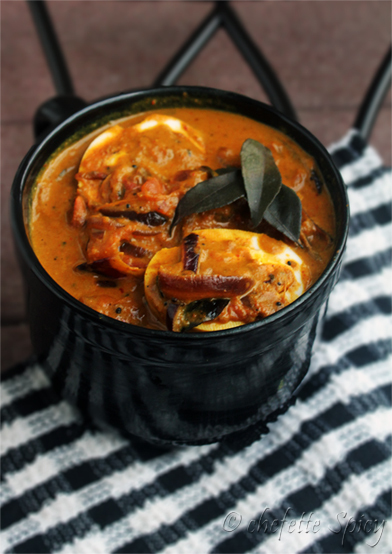 This dish is loosely based on the other Indian dish called Dahiwala Paneer or Paneer Dahiwala. 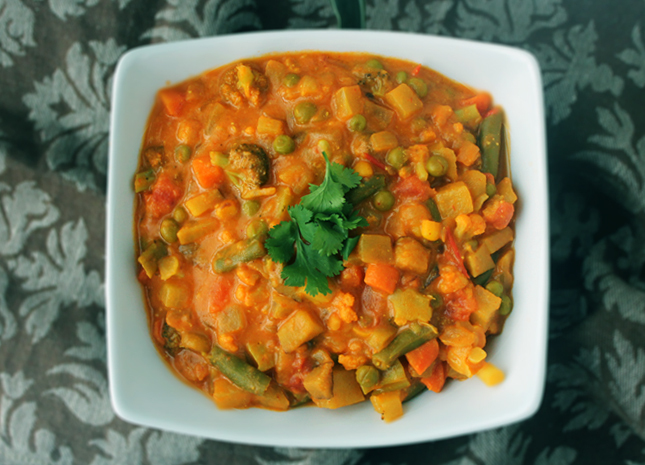 I came across this recipe on Tarla Dalal’s website once and bookmarked it for future use. Fast forward a year and I discovered today that my book on Paneer had the same recipe (no surprises there since it was written by the same chef). Although I started the Subzi by following the book, I gradually branched out and threw in ingredients that I found fitting. Hence, you can call it anything you want. I won’t blame you. We bought a huge slab of Paneer last week in Atlanta and Kishore was going crazy trying to decide what he wanted me to make out of it. These days, it is a pretty huge task, trying to find a good recipe for this Indian cheese that would make it the star of the show. I blame this obsession on the lack of fresh Paneer available at our local Indian grocers. Most of the time, I end up making it from scratch. At times like these, I buy it from Atlanta when we go shopping once in two months. Not surprisingly, the hub prefers the commercial version and I kinda don’t blame him for that. It is less crumbly and it doesn’t disappear when you fry it. My mom rightly observed today that taste-wise, the homemade version kicks the commercial version any day! What I am trying to say is, make it or buy it, that is your call. Heat the oil in a pan. Add all the seeds and when they begin to crackle, add the sliced onion. Let it caramelize on low heat. When it turns golden brown, up the heat to medium and add the ginger-garlic paste and cherry tomatoes. Saute for two minutes and then add the tomato paste, water, turmeric powder, cayenne powder, Chat Masala and salt. Let it cook for five minutes. When done, mix in the Paneer. Give it three minutes to cook. Now add the yogurt and milk along with the Kasuri Methi and all-purpose flour. Cover and let it simmer on low heat for five to seven minutes. Once done, switch off the heat and garnish with cilantro leaves. If the gravy is too thick, add some water. If it is watery (which I doubt it will), add another tsp of AP and let it simmer for a few more minutes without the lid. Categories: Food, Gravy, gravy, Indian, North, Recipe, roti, Subzi | Tags: dahiwala, masala, paneer, yogurt | Permalink. This here is the reason why my mom should be blogging this post instead of me. I seldom go into the kitchen these days and hardly give an idea for what to make for a meal. Hence, when Amma asked me what we should make for dinner tonight, I, being my ever helpful self, suggested Chapati. I brought Mallika Badrinath’s 100 Delicious Curries book to her and asked her to make any Subzi she fancied from it. And then, I went to sleep. At 2pm. In my defense, I had just put Aarabhi down for a nap and I was excited about taking advantage of the quiet house. This Subzi, my mother informed me when I tumbled out of bed in search of coffee at 5pm, was a fusion of two sides from the book. It is a wonderful option for Rotis, can be made fancy if you are entertaining and a great accompaniment for Jeera Rice or any fried rice/Pulao/Biriyani you decide to make. Heat the oil in a saute pan. Fry the onion until slightly brown. Add the ground paste. Fry until the raw smell goes away. Add a Tbsp sour cream. Add the chopped tomatoes and fry until mushy. Add another Tbsp sour cream the puree and the vegetables. Mix in the salt and cayenne pepper powder. Add the rest of the sour cream. If too thick, add a little water. Let it simmer until semi-solid. Garnish with cilantro. Categories: amma, Food, From Amma's Trove, Gravy, gravy, Indian, Indian, North, Recipe, roti, Subzi | Tags: Indian, masala, poppy seeds, roti, subzi, vegetables | Permalink. I crave eggplant all the time. No, not the huge western kind or the thin, long Asian kind. 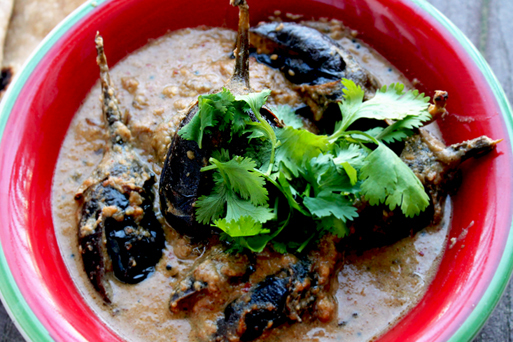 I mean the mini, fleshy Indian eggplant that is the star of many of my successful recipes. Every region in India has its own signature eggplant dish and the most popular method of making an Indian eggplant curry is stuffing the hell outta these purple lovelies. But what are they stuffed with, is the question. In Southern India, we use a combination of roasted, freshly ground lentils, red chili peppers and a few other condiments. In the upper part of India, they love stuffing them with pickling spices, a puree of onions and tomatoes. In the West, things get more interesting and you will understand why as you read on. I found this recipe of Bharli Vangi/Bharwa Baingan (stuffed eggplant), a very tasty Maharashtrian Subzi in one of my recipe books. I’ve been meaning to try it out for such a long time. 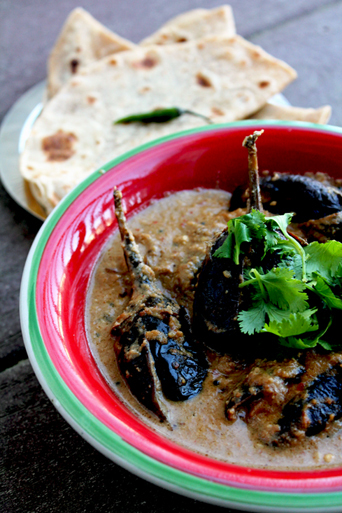 We had an Indian eggplant scarcity at our ethnic store for most part of winter. The minute they stocked it back a month ago, I’ve been buying them in huge quantities like a crazed person and making different types of stuffed eggplant curries. First came the Enna Kaththirikkai (Oil fried eggplant or as we call it, brinjal), then the Achari Baingan (eggplant gravy stuffed with pickling spices) happened and today, I had to finish off the last of the vegetable in stock. Hence, I made Bharli Vangi and it did not disappoint! This dish requires some extra knife work for slitting and stuffing the eggplants so I’ve done my best at photographing the process. I hope it works! Slit open the bottom of each eggplant deep enough to stuff the Masala. Leave the stems intact for easier handling. 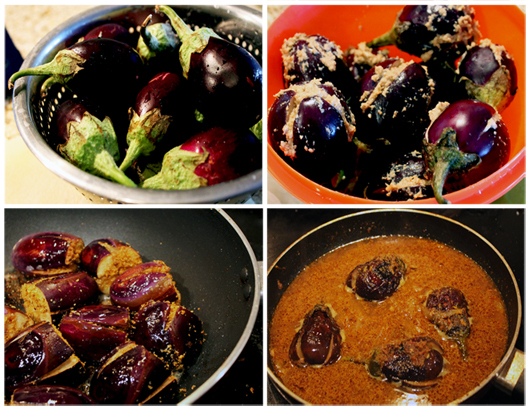 Soak the eggplants in salted warm water for ten minutes. Meanwhile, make the spice mix: Dry roast the grated coconut, peanuts, sesame seeds, chili pepper and cumin-coriander seeds (don’t roast if you use the powder mix) until fragrant. When done, mix in the tamarind pulp, jaggery/brown sugar, turmeric, two Tbsps of chopped onion and one tsp salt and blend it in a blender until you get a fine paste. Take the eggplants off the water and pat them dry. Stuff the eggplants with this mixture. Reserve the rest of the mixture for the gravy. Heat a pan with oil, pop the mustard seeds. Add the sliced onions and saute on med-low heat until slightly brow. Add the stuffed eggplants to this party and let it brown on all the sides. You can use the stems of the eggplants for easy navigation on the pan. When the eggplants are brown, add the rest of the Masala, and salt to the pan, pour in a cup and a half of water, turn the heat to low and cover the pan. The eggplants will steam and cook in the gravy. If you notice the gravy drying up, go on and add more water. The idea is for the eggplants to cook up until nearly mushy and for the gravy to come to a nice thick consistency. It will probably take around twenty minutes to half hour for that to happen. When done, squeeze the lime wedge and garnish with cilantro. Categories: East, Food, gravy, Healthy, Indian, Indian, Recipe, Subzi | Tags: baingan, bharli, bharli vangi, bharwa, bharwa baingan, eggplant, gravy, Indian, masala, stuffing, vangi | Permalink. 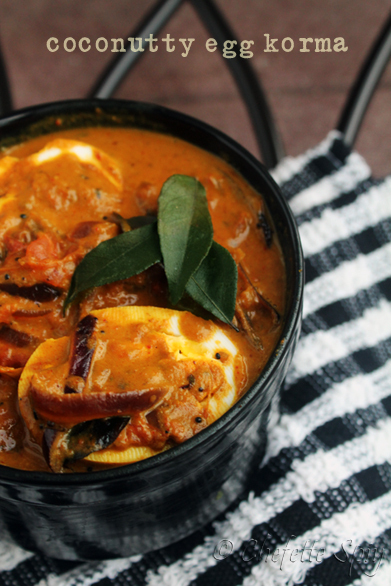 We Desis have a way of Indianizing every dish we can get our hands on. When we forget to weave that magic on a certain recipe, the rest of the world goes ahead and does it for us. I mean, Maggi Masala Noodles is a national snack of sorts back home and I have a friend who knows to make only one kind of pasta: the Marinara Masala Spaghetti, as I have dubbed it. While I do appreciate the eclectic flavor a multi-cuisine dish can radiate and get a kick out of reading about condiments and spices common to cuisines world over, I am a prude when it comes to my kitchen. Indo-Chinese is as far as I’ve ever gone since I am familiar with it. 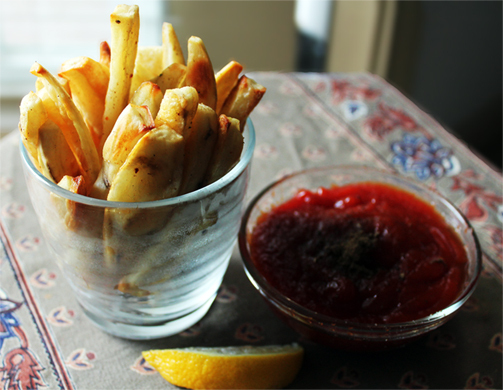 So when I made these fries this afternoon, I felt like I was standing at the pinnacle of my multi-cuisine creativity while in reality, all I did was add delicious Indian spices to basic French Fries. But in my defense, desperate times call for desperate measures. I’ve been hitting my books with a vengeance for, my exams are looming over me next week. When my academic adviser told me that combining Finance and Accounts in a term (note, not a semester but its evil condensed form), I knew I should have listened to her. Oh well, my bad. Studying this hard has left me with no motivation to cook, leave alone dress it up and click pretty pictures. So late last night, I remembered that two years of trying to perfect the non-fried French fries has yielded great results and I could play on that. Hence, my Indian fries were born today. One thing though: they are yummy. You might need to make double the batch. After half an hour of trying to get a few perfect shots, I realized that my fries had gone cold. That did not stop me from thanking god K was not home to steal from my plate and gobbling it all up while watching Cupcake Wars. What? A girl can take a break from balancing accounts, ya know! Preheat the oven to 425ºF (220ºC) Peel and cut potatoes length-wise into thick wedges. Pat the wedges down with paper towel or a kitchen cloth to dab out all the moisture. Transfer it to a bowl and add the salt and oil. There are two methods you can choose from now. You can either add the spices to this or save it up to add on after the fries are done. If you use Garam Masala, which has a pretty strong flavor, I suggest you add it before baking. Chat Masala is always tastier when garnished in the end. Make sure all the potato wedges are evenly coated with oil and spices. Lightly grease a baking sheet with PAM. Spread the potatoes in a single layer on the sheet and bake for 30 minutes, tossing once, 20 minutes into baking. The fries will end up golden and crispy on the outside and soft and done on the inside. When done, transfer to a bowl and mix in the spices. You could finish it off with a generous squeeze of lemon juice. Eat it with mint-cilantro chutney, spicy chat dip from the Pakoda post or as one of my friends on Facebook has suggested, onion Chutney. 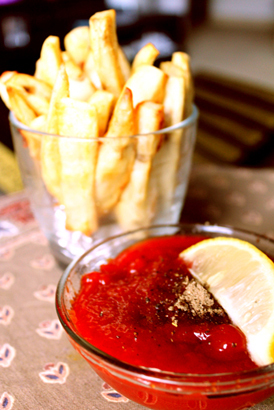 Categories: American, Food, Health, Recipe | Tags: chat, garam, indo-french fries, masala, potato | Permalink. 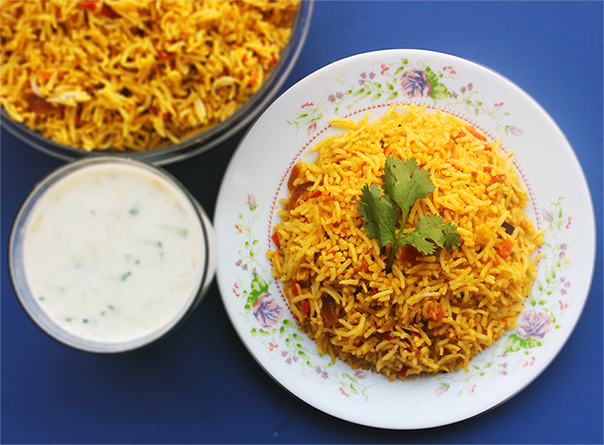 I cannot believe this is my first post on Biriyani! It is my all-time favorite dish and can eat it everyday if I had to. Thankfully, this world is big enough for more than hundred versions of Biriyani recipes and this one is from one of my best friends, A. It has a wonderful flavor and the spices can be adjusted according to how you want it to taste. 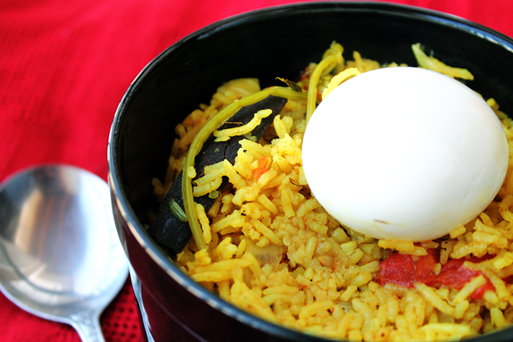 This recipe was for Chicken Biriyani but since we are all non-meat eaters at home, I converted it into a very tasty egg biriyani. And boy! It sure doesn’t disappoint. The vegetables you add could range from frozen vegetables in a bag or freshly cut ones. 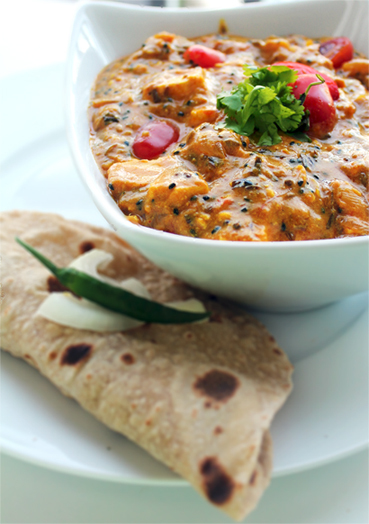 You can add mushrooms or Paneer (Indian cottage cheese) also to make it more interesting. But really, even without vegetables other than onion and tomato, this is an awesome dish and one I keep going back to! Before you start cooking, soak the rice in some water. In a dutch pan or a heavy bottom pan, heat the oil/butter. Reduce the heat to medium, add the spices to the pan and fry lightly. When the fragrance of the spices fills your kitchen, add the onion, ginger, garlic and chilis. Saute for a few minutes and add the tomatoes. This is when you add your other vegetables too if you are using. That includes mushrooms. If using Paneer, add it after the biriyani is completely done. Now mix in the turmeric, cayenne, salt and Garam Masala. While the vegetables cook, drain the rice and add it to the pan. Fry for a few minutes until the water is all absorbed. When done, add the cilantro, mint and Fenugreek leaves. Pour in the water, give it a swish and check for salt. If it is spicier for your taste, don’t worry. The rice will absorb it as it cooks. Now close 90% of the pan with a lid and let it cook for seven minutes. The rice will be half cooked by then. Give it a gentle toss, replace the lid and turn the heat to low. Cook it for roughly eight more minutes, until the water is all absorbed and the rice and vegetables are cooked. You can add the Paneer now. 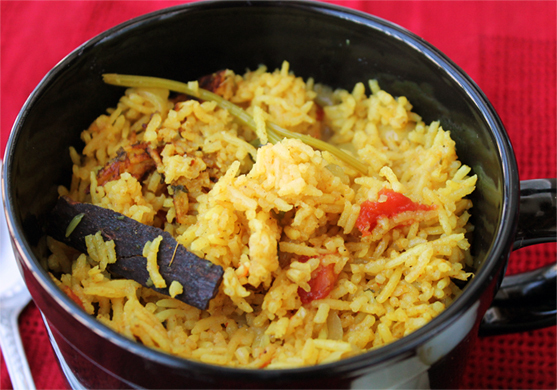 The South Indian Biriyani is never too flaky. It is a little lumpy but not mushy. Serve hot with Raita and the egg. Yumm! 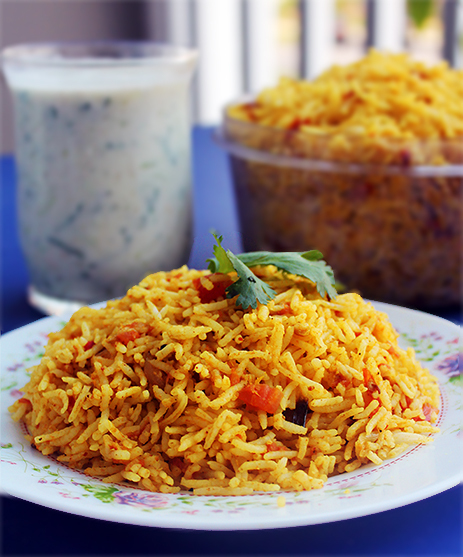 Categories: Food, Indian, Recipe, Rice | Tags: biriyani, egg, Friends, masala, south indian | Permalink.